I am battling a huge fleas infestation. It happens about every three years. I need to know if ethoxyl pyridine in low concentrations is safe to put on my dog. And, what is the difference between Nylar and Nyguard? I was assuming they were the same thing but brand names. HELP! IGR's are not going to eliminate flea infestations on their own. They are normally used as part of an overall treatment effort. The reason is that they do not kill anything. IGR's only function is to disrupt the life cycle of the target insects. They are about 90% effective. That means 10% of the population will not be effected. Bottom line is that ALL of the adults and 10% of immature stages will survive. If they insect population is huge, then getting 90% control over a period of time can help gain total control at some point. But only when adulticides are used to kill the adults. Otherwise, the adult fleas will continue to propogate and be happy. The is product is not intended to be used or applied to animals. It is not registered for that purpose. 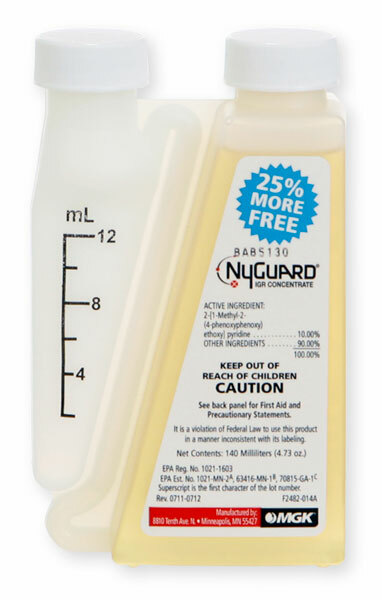 Here is a link to the label directions - http://www.epestsupply.com/images/Products/labels/NyGuardSpecimenLabel. You are correct, Nylar and Nyguard are both pyridine. The brand names are different.